We are going to share the latest and updated ANF undertaking for cargo inspection, we already discussed detail articles how to clear ANF examination step by step guide & ANF Help Line Numbers. 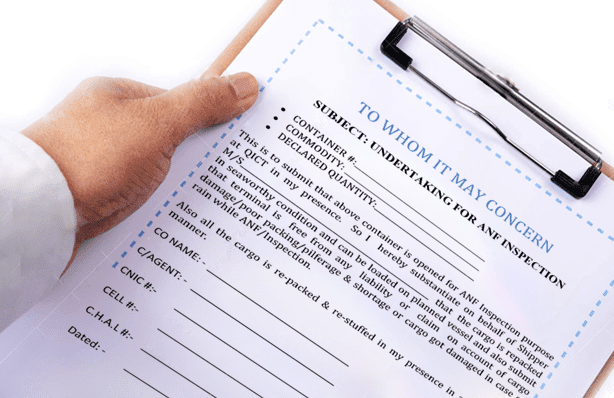 Today in this post you can download required undertaking for ANF Inspection. This is to submit that above container is opened for ANF Inspection purpose at QICT in my presence. So I hereby substantiate on behalf of Shipper M/S____________________________________________________ that the cargo is repacked in seaworthy condition and can be loaded on planned vessel and also submit that terminal is free from any liability or claim on account of cargo damage/poor packing/pilferage & shortage or cargo got damaged in case of rain while ANF/Inspection. Also all the cargo is re-packed & re-stuffed in my presence in appropriate manner.